With our reputation in commercial property marketing and with our ever growing collection of bespoke investment portfolios under our belt, we were exclusively appointed by the Cushman & Wakefield retail investment team to create and produce a full marketing campaign for the prestigious investment opportunity. SouthGate, since its opening in 2010, has grown to become one of the area’s most popular regional shopping destinations, offering 38,369 square metres of retail and leisure space accommodated in a unique open street mall in Georgian style architecture. Bath is a regional centre located in the south west of England in the county of Somerset. 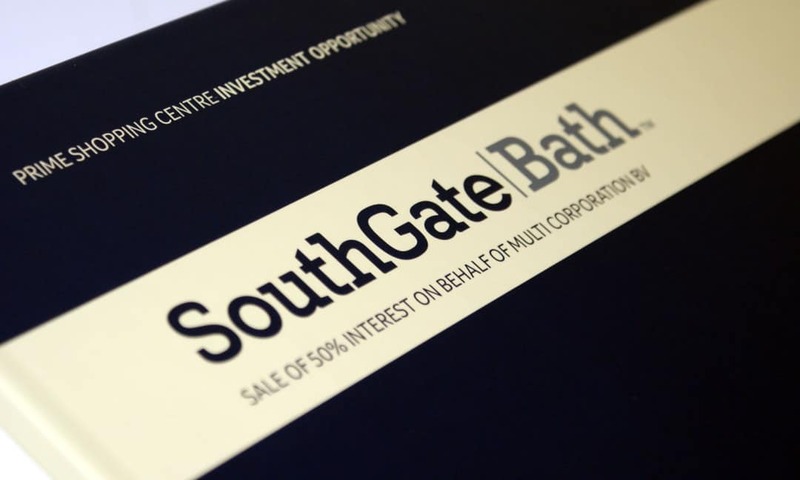 In 1987 the city was awarded status as a UNESCO world heritage site recognising its international cultural significance with major historic sites including the Roman Bath, Bath Abbey, Royal Crescent, and the historic Grade two listed Bath Spa Railway Station. When instructed on a job of this scale, it’s important to first identify what is required and to act on it swiftly, something our team are more than capable of doing. A 44 page case bound, oversized A4 brochure was produced, filled with aerial and location photography of the scheme, custom maps and charts, a detailed in-depth analysis of the site’s financial standings, along with information about the area’s unique history and heritage. The brochure was also created in an interactive format, making it easily accessible. To complement the brochure a custom built interactive website and data room was designed and developed. The site includes a selection of fully downloadable documents, which can be accessed through a secure login system. All downloads can be monitored through a statistics segment, with site traffic readily available to the vendor when called upon, allowing them to monitor the activity of interested parties.